All transactions are safe and secure with a reliable history in online purchasing behind each of our associates. Buy the Monty Python Costumes and Helmets to own Monty Python clothing and merchandise. 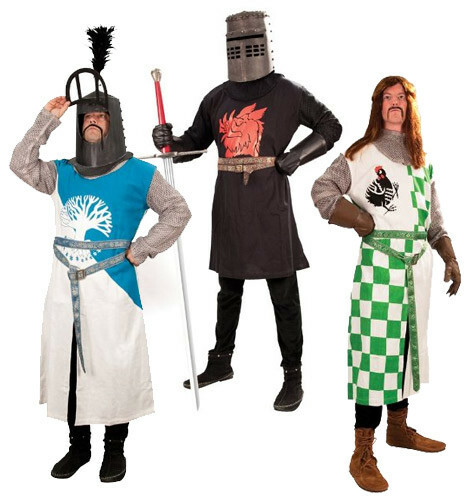 Outfit yourself in the tunic of either King Arthur (left), the Black Knight (middle), or Sir Bedevere (right). Create your own Monty Python costume with one of these great replicas. Add a Monty Python helmet to complete your ensemble. Some of the helmets, though well made, run small and may be better used as collector's pieces. Read the reviews or contact the seller for more information. Represent your favorite character with one of these Holy Grail costumes (tunics). In addition to the Monty Python Costumes and Helmets above, browse the Monty Python Clothing Gallery for more apparel like men's and women's clothes, kids shirts or hoodies.